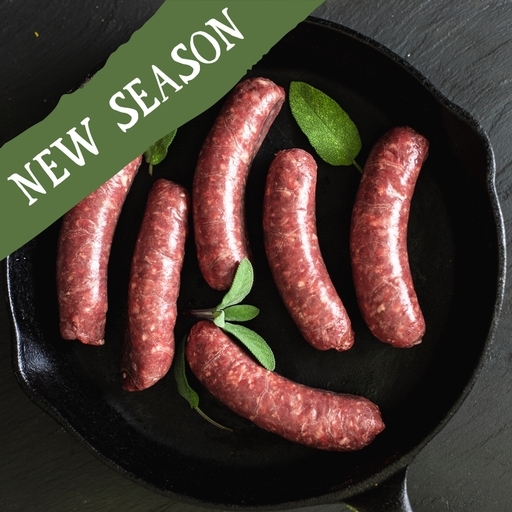 Fresh organic venison sausages, made in our butchery with prime quality West Country venison. Our traditional recipe gives a coarse, meaty texture – with a little organic pork added for a balanced, gentle flavour. Sizzle and serve with buttery mash and cabbage, or try venison toad-in-the-hole. Warming seasonal comfort food. Our venison has a short season - we think that it will be available to buy until about the 23rd of November depending on how fast it sells.